Part of the process of getting dentures often includes being fitted for temporary dentures to use until the permanent ones are ready. 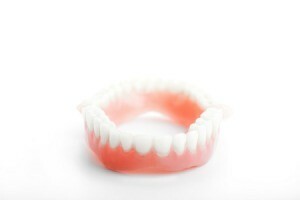 This is a guide about getting temporary dentures. Just got my dentures 5 days ago. They pulled out 19 teeth then I was given temporary teeth. I get my new ones in 9 months. My mouth feels full with these dentures. I find myself drooling at times. Plus my gum line is sore from removing them. The glue pulls on my gums as I am taking them out. Do I have to leave them all the time? I had been told to leave them in my until they heal. They also give me a upper bite. Is this normal? Not to mention my speech is no good. Can somebody recommend a glue that will keep them in? There is a waiting period of at least a month in adjusting to dentures. If you think about it, youare adjusting to ahving a foreign object in your mouth all the time. Clove oil can help with pain, as can ice. You could use Anbesol as a temporary fix, but you should contact the dentist as soon as possible. I would go back to dentist and ask for a soft liner .this is what I did they told me not to use glue so it doesn't get into the holes. The soft liner I love cause if they get loose you can run under hot water an put them in an push up then bite down an it kinda like resets and then stays. 11 days ago I had all my upper and lower teeth pulled. Temporary dentures were put in immediately. My question is, should I be wearing them 24 hours a day minus taking them out cleaning, rinsing, etc. Or should I be taking and leaving them out at night? Your dentist is the best person to contact regarding your questions as they did the dental work and fit for your dentures. I agree. But I can tell you what my dentist said. She advised me to take my uppers out each night as leaving them in was softening the roof of my mouth. So a quick call or google search will put your mind and mouth at ease. When my upper plate (temporary, like yours - I'm on the permanent one now and love it) went in immediately after the teeth were extracted, my dentist said to remove the plate that and every night (or whatever is the regular sleep period). He said the chance of the plate slipping and choking me in my sleep outweighed any wound compression (to stop/control bleeding) benefits. I was a little nervous about removing the plate that first night but it didn't hurt at all - the next morning there was a fair bit of swelling where the teeth had been pulled but the plate went in painlessly and by the end of the day I was surprised to find the extraction site swelling was completely gone. If your experience has been different (continued pain and swelling, pain on removal/re-insertion), be sure to contact your dentist - he/she has a duty of care and you should never hesitate to ask for guidance concerning wearing and caring for your new dentures! Question: Temporary Dentures Painful ? I had my all my teeth pulled January 4th 2016 and then they gave me my temporary dentures. I wore them for about two weeks and then my mouth starting hurting badly from the dentures. I went to them and they adjusted them. I thought it was fine, but it just got worse so I stopped wearing them. Will I be able to wear my permanent ones when I get them? You need to go back to the dentist. Going with out could affect how the new ones fit. I had 15 teeth extracted last week. How long do I have to wait before I get a temporary denture? My gums are still very swollen and tender. I can't imagine having an impression done right now. I had my dentures made before my extractions and they were put in my mouth before I woke up. I understand that the gums shrink at a fast rate the first month, then continue to shrink over 6 months or so but at a slower pace. I would wait a few weeks for the tenderness to go away before you do impressions. My gums didn't stay sore for a long time, maybe 3 weeks to a month. You will have to go back several times for adjustments to your dentures to get a proper fit. Make sure those adjustments are included in the price of the dentures.